Well, I'm not ready to share the details just yet BUT, I think my "for ever and for always" house is coming sooner than I thought. I promise. More details when the time is right. ANYWAY... I've been toying with ideas for backsplashes and have come across some really neat ones. Some are super cheap, others are just simple, and still others are just plain smart. 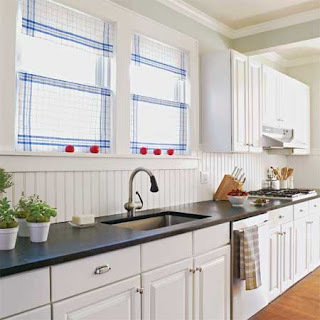 Board and Batten: Using thin strips of wood you can add a little something to your wall. 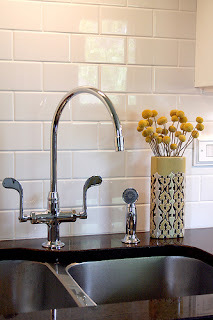 This is great if you want to be non-commital about your backsplash or if you're saving up money for something a little more expensive down the road. Some great tips can be found at Funky Junk. Painted Glass: Looking for something a smidge more modern? How about a glass background. Pick your paint color, paint the back of a piece of custom cut glass and put it up. How? Okay, I don't really know exactly how, but at least the idea is simple! Wainscoting: So clean and classy with a touch of country. You can go wide board or thing beadboard. This involves some patience but all you need is a sheet of wainscoting that you can buy from Home Depot, a saw, caulking, and possibly small trim, depending on your space. Tin Tiles: You can purchase tiles like these at Lowes or Home Depot and make it simple or go all out. Paint: If you have a color you LOVE, why not show it off? I particularly like the small bit of tile backsplash beghind the stove to change this kitchen up a little. Chalkboard Paint: Fairly inexpensive and fun! I'm not sure I'd ever actually write anything on there but if your handwriting is nice and you're forgetful, this may be for you! Wallpaper: As much as I don't love putting up and taking down wallpaper, I kinda love this idea. Especially when it's done in fun prints like these. Tile: Oh, dear while subway tile... how I love thee. Then again, why stick with boring white when you can have these?